Oh, and I just realized that today is one month since the comic started! Woohoo! Almost 1000 uniques in a month...that's pretty good, right? I once had a dream where I had to pee really bad. Throughout the dream I searched for a toilet. When I woke up I discovered I had to pee really bad. Sometimes dreams do come true. bahaha, holy crap. I laughed for about 5 minutes when I read that, xila. Thank you, I needed a really good laugh. From physics to the psychology of dreams... you put us all to shame, Shaggers. And yes, 1000 uniques per month is pretty damn decent. It's weird how there's a sort of crossover between dreams and reality. 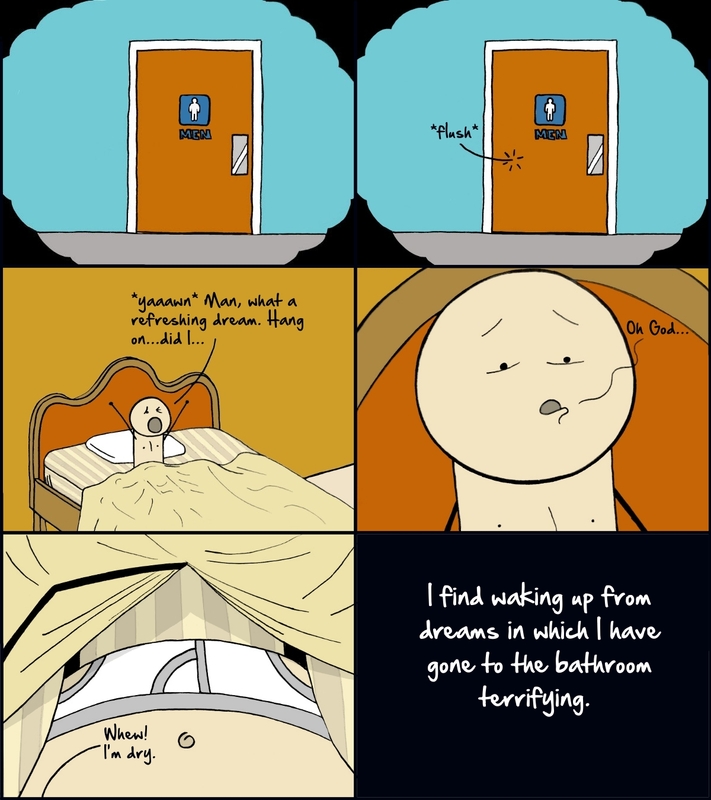 Sure it's usually pretty physical like real sounds getting into a dream or the need to pee but there's also when you wake up and the feelings or visions of a dream are still with you. That was kinda fucked up and probably belongs into Drugs are Magic. @ em kultra: I totally know what you mean. I've had dreams where I got a new car or something and it isn't until I go to the garage that I realize it was just a dream. That's usually extremely disappointing. i have a lot of dreams where i get stabbed and i can feel the knife in my body and when i wake up o have a mark where i got stabbed. @ Magravan: Hmm...that's weird. Thanks for letting me know. I mean, about the previous button, not about your bladder control XD. All I can say is that I have two previous buttons and only the one on top of the comic is malfunctioning. So use the bottom one 'til I get the top working. Edit:Hot damn! I already fixed it. I'm so much better at html than I used to be. If you had told me about the previous button about a week ago, I would have said deal with it. lol.